…was what went through my mind in the summer of 2017 when I received an e-mail from the Department for Work and Pensions (DWP). Why had my name come to the Department's attention? I thought perhaps I had left my coat in the Bicester Jobcentre when I went in there to 'sign on' in 1982. No such luck! The reason they had contacted me was to ask if I'd be interested in applying for a new role. But I love my job running The Prince’s Trust in Wales I thought. What other job could I possibly want other than joining the Test Match Special team? No, they said, we'd like you to apply for a role as a member of the Social Security Advisory Committee (SSAC). The SSAC I discovered, is an independent body of 14 people drawn from different backgrounds across the UK which scrutinises changes to UK Government welfare policy and makes recommendations on how it might be improved. Ah! Here’s my 'get-out clause' I thought, given that technical regulations hidden in the depths of secondary legislation would never be my Mastermind specialist subject, they must have the wrong Jones. There are, after all, a lot of us in Wales. No, they said, we'd like you to apply. So I did. It turns out the role of 'enthusiastic amateur' was currently vacant and in February, I was appointed onto the Committee. I have since attended my first of what will be around 12 meetings a year. It was fascinating; particularly as our current area of interest (as part of the Committee’s Independent Work Programme) right now is young vulnerable people living independently. To that end, SSAC came to Wales for two days this week to ‘dig into’ this subject matter. The visit included a meeting with the Welsh Government Minister Rebecca Evans AM, Welsh Government officials and local 3rd Sector organisations such as the Llamau and Wallich charities and Citizens Advice. 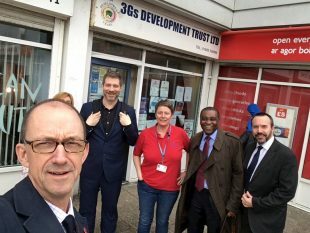 We also visited DWP Jobcentres and related programmes and ran a really useful focus group with young people with The Prince’s Trust in Cardiff. Relationships. SSAC is only as good as the strength of its relationships and awareness of local challenges and opportunities. There’s good and bad out there. As evidenced in JRF’s recent report, poverty levels in Wales are improving but entrenched issues remain – particularly with disabled people in poverty and young economically inactive. ‘Joining the dots’ at a local level can be transformational for people’s lives. An example is the Communities for Work (C4W) initiative in Wales which links Welsh Government, DWP, local charities and employers – with the young person at its centre. The working poverty conundrum. Remember there’s in-work as well as out-of-work poverty. So maybe poverty and employment targets should be aligned. DWP MUST SIMPLIFY THE LANGUAGE! As the SSAC member representing the interests of Wales, I look forward to continuing to have a constructive dialogue with our stakeholders and ensuring that the issues raised by them help to shape the advice we provide to Ministers.